On May 11, 1995, at 30, Roy’s life was irrevocably changed. After walking into the hospital, he was admitted and later received the worst possible diagnosis – Primary Progressive Multiple Sclerosis. His doctors gave him two years to live, and he left the hospital in a wheelchair. Roy, not one for giving up, and having a, then, three-year-old daughter and an 11-year-old son, went immediately into human subjects research at UCLA and spent 12 years (1995–2007) as a human research subject. His experience gave him a unique look behind the scenes of medicine and the processes that are required to get drugs through the research chain, from the animal research phase to using those drugs in humans in clinical trials, and, if successful, on to the FDA for approval. Roy participated in four major experimental drug trials, and one of those ended up giving him thyroid cancer, which was diagnosed in January 2001. Meet Dr. Roy A. Teel Jr.
Roy is a proud cancer survivor and has refused to let MS define his life. His dedication to his work and to human subject research both inspired his writing as well as showed the real human condition when laid bare. As an author, Roy A. Teel Jr. is very diverse, and his works include both fiction and nonfiction. He earned his bachelor’s degree in Ministerial Studies through Berean University of the Assemblies of God then went on to earn doctorates of Divinity and Biblical Studies through ULC Ministries. Roy’s first nonfiction book, The Way, The Truth, and The Lies: How the Gospels Mislead Christians about Jesus’ True Message, was published in 2005 and is taught in both religious and secular universities in the U.S. and abroad. Against The Grain: The American Mega-Church and its Culture of Control was published in 2008. This second book reveals the unflattering true faces of the “Goliaths of God” and shows religion and churches for what they really are – businesses – very, very lucrative and influential businesses involved in many facets of American society. In 2008, Roy published a collection of short stories titled, Light of Darkness: Dialogues in Death. These collected stories were inspired by both his difficult and troubled childhood as well as his years in clinical trials. He met and knew many people, many whom lost the battle due to natural causes, or in some cases, by their own hand, that he felt compelled to fictionalize and share their stories. In 2013, Roy released his first novel, And God Laughed, a neoplatonic dialogue between one man and God. Although now a secular humanist, Roy believes in God but rejects all religions as man’s folly and wrote a fictional narrative about a relationship with God outside of religion. 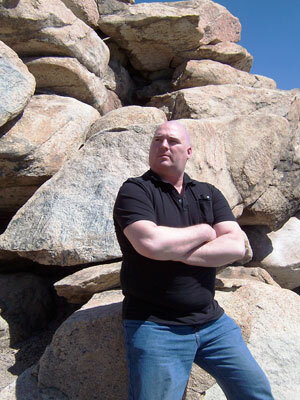 In 2014, Roy began publishing his latest and largest project – 30-book geographically-centered hard boiled, mystery, suspense, thriller crime series: “The Iron Eagle Series.” The main character, a former Marine Corps Black Operative turned rogue FBI agent, hunts serial killers in Los Angeles. Each novel addresses different subjects, and while fiction, all titles deal with real world subject matter. “The Iron Eagle Series” is not about things that can’t hurt you. What happens in these novels can happen to any one of us if we let our guard down and/?or are in the wrong place at the wrong time. You can purchase the books on here. After battling Multiple Sclerosis for nearly 16 years, Roy began devoting his energies and passions to the full-time art of storytelling. Although he is no longer able to work in a high stress executive environment, his life has taken on a new mission: to inform and entertain. His disability has brought with it an unforeseen blessing. He can finally take medications to alleviate some of the pain from his MS and focus on the pleasures of character creation and the joys of putting words to paper.